Vacation rental house. Sleeps 12, 5 bedrooms, 4 bathrooms. Dogs allowed. 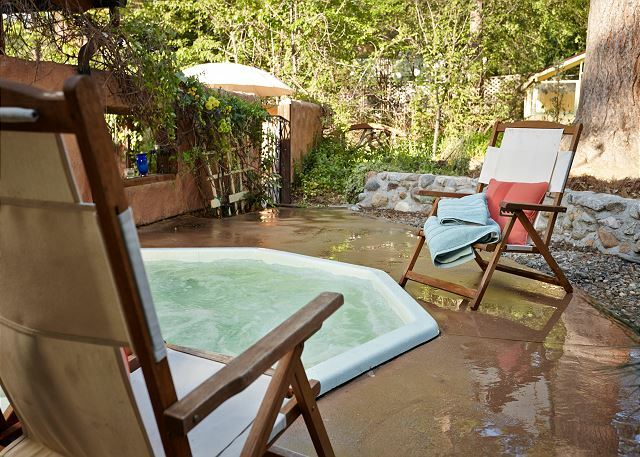 Take a dip in the spa & enjoy all the nature Idyllwild has to offer. Living room and fireplace that give you that relaxing feel. Large kitchen, to show off your master chef skills to friends and family. Open living room & kitchen invites you and your guest in. Master bedroom has king sized bed and TV with firestick. 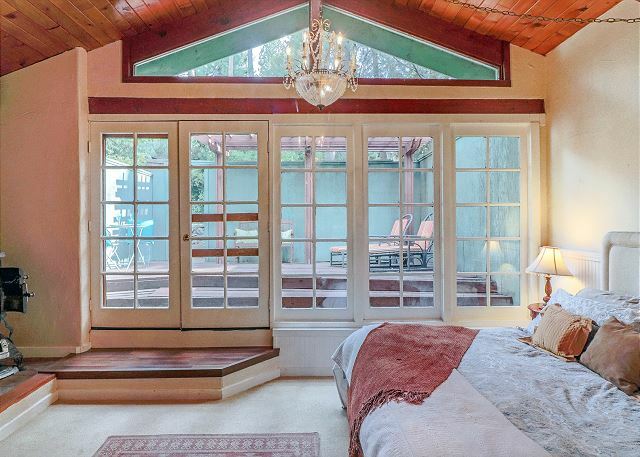 Master bedroom also has private patio. 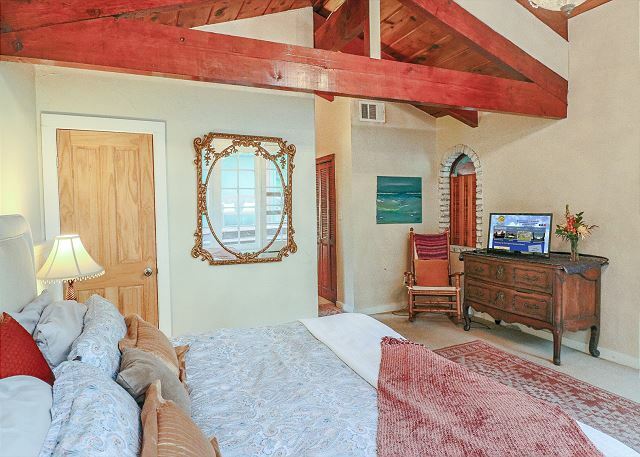 Master bedroom with private patio, pot belly fireplace and king size bed. 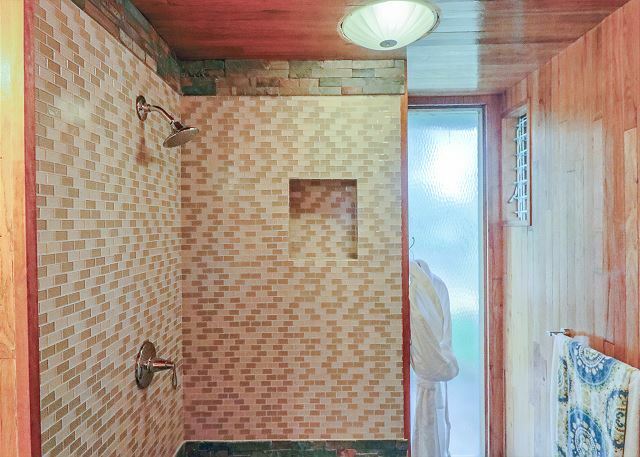 Master bathroom with walk-in shower. 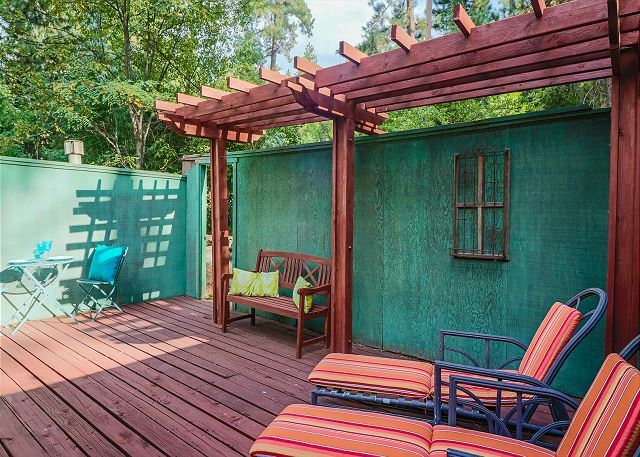 Private patio connected to master bedroom. Bedroom with queen sized bed. Beautifully decorated. 4th bedroom kids room with bunk bed. 5th bedroom with queen sized bed. Spanish Villa in the Mountains. Private patio for master bedroom. Kids room bedroom with bunk beds. 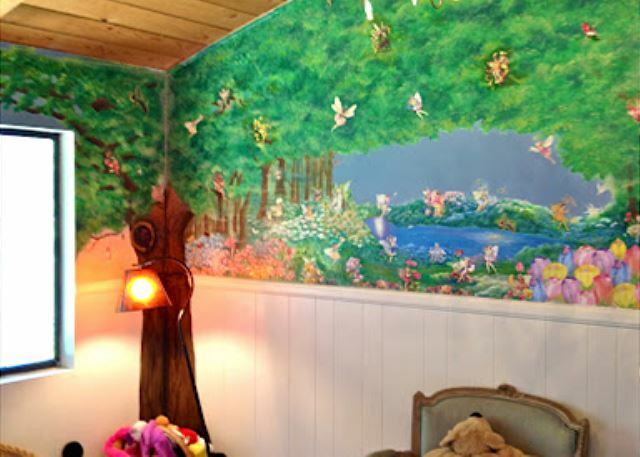 Bedroom with bunk beds and beautiful mural. 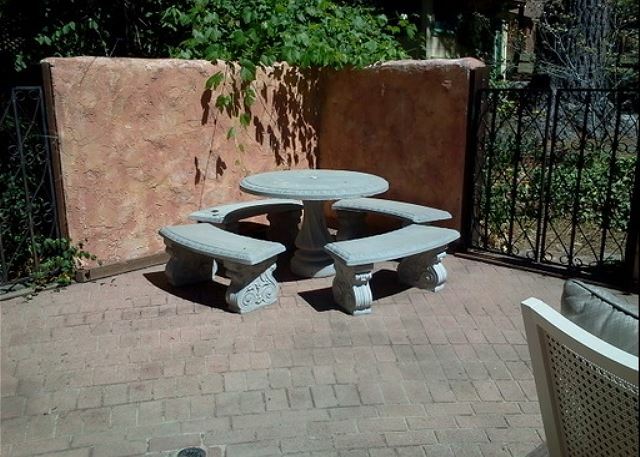 Backyard, 1 of 3 patio dining sets. 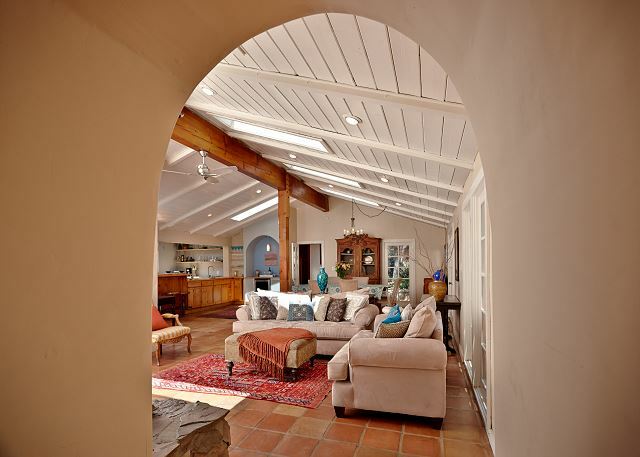 Welcome to our Spanish Villa in the Mountains, "La Casita"! 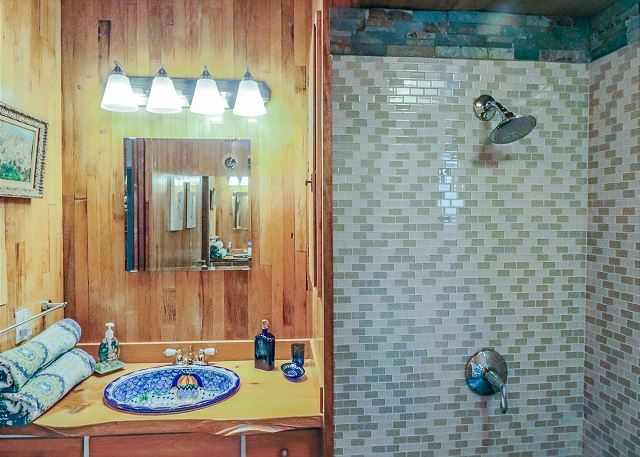 This home is so unique, pictures do not reveal it's eccentric beauty! 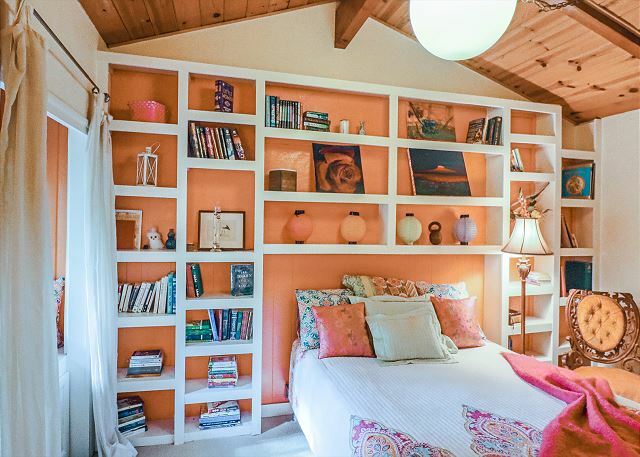 "La Casita" features 5 bedrooms, 4 baths, family room, living room, and dining room. This home is spacious and offers every amenity for guests' needs. This home has a full kitchen with all the upgrades! 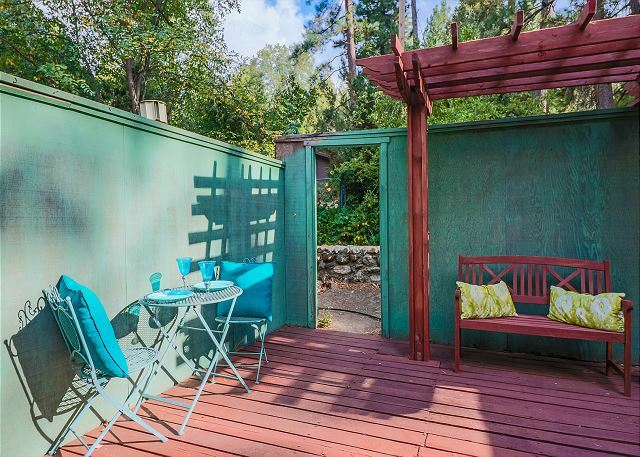 Located near the prestigious Idyllwild Arts Campus, "La Casita" is a walk to all the hot events at the school or in town! 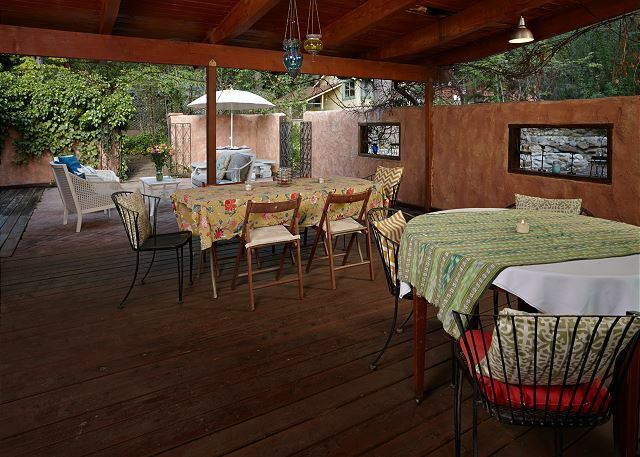 Come relax and live luxuriously at "La Casita". Newest addition to the home is a ping-pong table, perfect for some friendly competition amongst the group! Weekend rate Friday/Saturday is $425.00 p/night. Weekday rate Sunday thru Thursday is $425.00 p/night. Winter Holiday rate $600.00 p/night (Thanksgiving, Christmas and for New Year's, with a 4 night minimum). Holiday rate $500.00 p/night, a 3 day minimum may be required. Call us for our weekly/monthly specials. Pets are welcome. Pet fee will apply. Linen/Prep fee $150.00. 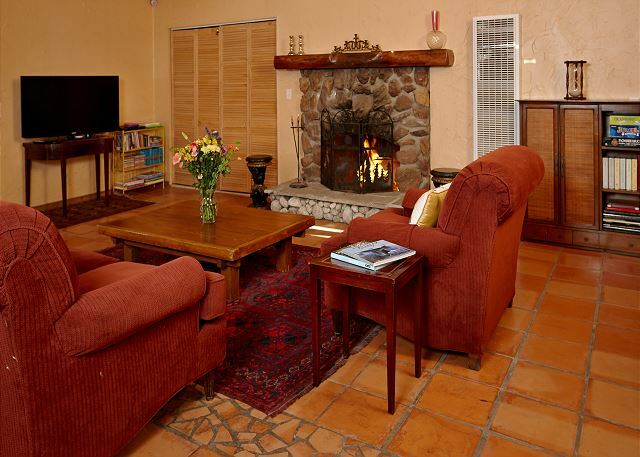 La Casita was clean, beautiful and spacious, and Idyllwild just lovely. Communication with Monica and Nikki were very easy. We were a party of 12, with 6 adults and 6 toddlers (ages 3-6). We had a lot of fun playing games, cooking together, and going for a stroll. Sad that we could not stay longer due to kids' school schedule. Would definitely recommend very highly! We went with two friends family and had a very good time. The house is big enough to accommodate 11-12 people. It has a lot of charm and overall, it’s a very nice house. The kitchen is enormous and it’s a pleasure to cook in it. It was fully equipped, and you don’t have to worry about anything. 1) I guess some of the house areas are additions and the heating of the house was very unequal. Some of the rooms was extremely hot, while the other freezing cold. I don’t know about the cooling. We were there during the spring and was still cold outside. 2) Some of the bathroom doors were completely broken and it was a challenge to open and close them. The bathroom that we used was very strange as configuration and it was a difficult to use. Overall, we were happy and spend very good time there besides every challenge thing. Beautiful and spacious house with a great kitchen! It was great for our large group of 9. Clean, well maintained with comfortable beds. Plenty of spots for groups to relax, both inside and out. There were a couple of issues with the fireplace and oven that we reported but overall we had a great stay! The spa did not appear very clean so we did not use it. New Spirit Rentals made our rental experience very easy. The check in process was quick and streamlined and the people in the office were responsive and friendly. The La Casita cabin was perfect for our group of 10. It was large enough that we could have our own space for sleeping and changing, yet also provided plenty of shared space for us to hang out together. The lack of a shower curtain on the shower in the master bathroom made it impossible to use without getting water everywhere. Also, there are no window treatments on the windows which can make you feel as if you are being watched even though the property is secure. Overall, we were very happy with our selection of La Casita and would definitely stay there again. Everything was wonderful from the folks at the rental office to the lovely home. It is large and roomy enough to accommodate 7 adults and two kids. The house was very well equipped with everything we could have wanted. The staff at New Spurit always go beyond to make sure we were comfortable. The space is HUGE! Perfect for a large group. We had 10 adults and 2 kids.The kitchen is well stocked, which is always a bonus. Five couples! No kids! Lots of fun! We were 12 dedicated quilters from YumaAz We are a returning group.We were very pleased with the reception when we arrived.Every thing was very neat and tidy.We had plenty of room to set up all 12 sewing machines,cutting tables and a design wall. Cooking for 12 was no problem. La Cassita is a perfect retreat for family and friend get-away. Large and roomy with enough bedrooms and baths. Alan, Thank you so much for your nice review! We look forward to welcoming you and your family back to one of our properties for your next getaway. Warm Regards, New Spirit Vacation Homes. We stayed here with 6 adults and 6 kids and it was wonderful! The photos don't show, but the backyard is great for kids. It is multi level and really fun to play in. It was mostly fenced, but had been torn down in one spot so you have to watch young kids so they don't escape. We brought far more than we needed as the house was very well stocked from a wonderful chef friendly kitchen to toys and games for the kids. There was lots of snow when we went and I was worried it would be cold, but the house is very well insulated and the fireplace is so cozy. The hot tub wasn't working, which was a bummer, but the management company was great and planned to fix it the day after we left. One trick - the room with the queen gets very hot if the heater is on. Our friends found it was best with the door and window open. The house is so much nicer than the photos even show and I would highly recommend it. It was beautiful! Very large and accommodating. Fully stocked kitchen. The hot tub was beautiful on a snowy night. We had a wonderful time at this home! So much space for all 10 of us. Great jacuzzi, kitchen, and beautifully decorated. Bonus Christmas tree to make it perfect! Outstanding customer service at New Spirit! The house has lots of space and the layout is perfect for family time. As first time renters, our expectations were probably not realistic. We anticipated hotel quality accommodations. The house had minor issues such as a bathroom door that would not close and screen doors that scraped the floor so hard to open/close. The yard is fenced so it was perfect for our dogs. The hot tub worked great! Beautiful dining table that sat our family of 7 adults. Make sure you have your own Netflix account to watch TV. We would definitely stay here again now that we know what to expect. The home is beautiful and so spacious! Really enjoyed my stay and will go back for sure!! The folks at New Spirit are so helpful and available if you need anything. I really appreciated that tremendously! The house is perfectly spread out for a large group. All of the household belongings are so unique and every room has its own personality. 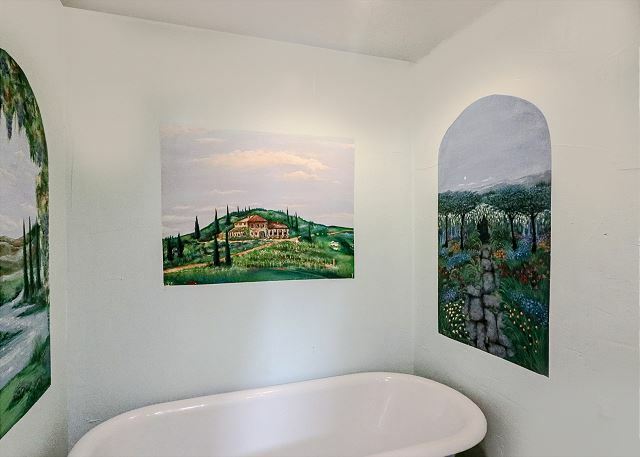 The owners definitely have a boho artist soul of sorts. The kitchen was beautiful. Everything is gently used, which is good for a rental. This way you dont feel like you have the potential to ware anything out. The hot tub was the easiest to use in any rental I have had before. I would definitely stay here again. We had a wonderful stay at this beautiful big house. This house offered everything for a Summer day's stay. We didn't have any major issues. 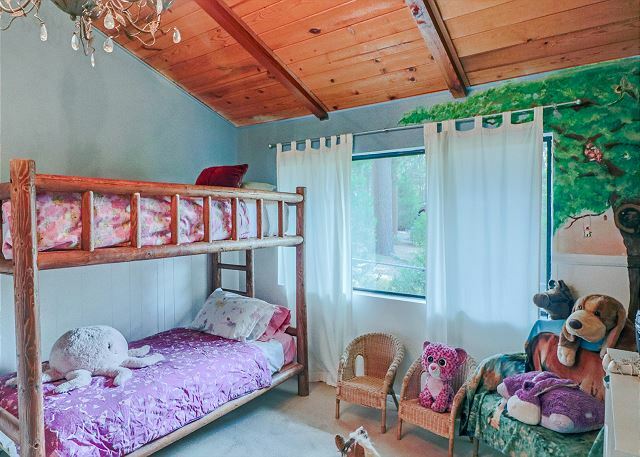 The property is on a peaceful Idyllwild street but also is a quick drive to the town center. The backyard could use some mending and caring. We used the big kitchen so much and prepared multiple meals. I wish the stove is upgraded to a modern one. The burners are the old types - it needed to be manually lighted. The property management personnel were very friendly and also obliged for an hour's extension for our check-out. Overall we had a lovely experience. Will definitely come back. The interior was lovely, spacious & adequate for a family reunion of 11 ppl...a few suggestions: more towels & racks in bedrooms to hang towels since not enough space in bathrooms. Make better use of "family suite" to left of entrance w/ sleeper sofa & trundle bed. Provide more paper products; or inform guests ahead of time to bring their own supplies: garbage bags, paper towels, napkins, paper plates, etc...Eliminate all opened food products fr pantry...nobody wants other ppl's food; plus they attract ants! The dining room chairs were "rump sprung", need repair. Porch furniture was great but cushions were dirty/dusty. Landscaping needed attention; overgrown & messy. Swingset & playhouse in disrepair & dangerous for kids...Needs to be repaired or taken down all together. We mainly hiked, gathered around the fireplace, cooked gourmet meals & walked into town...we liked the Barbque/band eatery on the corner& the dog boutique. Thank you so much for taking the time send us message regarding your stay at our La Casita property. Per your message seems like the reunion turned out to be a wonderful event, property was a good choice as was Idyllwild all and in itself. Also thank you for making mention of some attention areas and we please need for you to know; >Bathroom Towel Racks- As with many of our properties we utilize both wall mount racks and decorative baskets which makes for a better presentation. In addition at this property a complete second set of linens/towels are stored in the laundry room next to the kitchen. >Family suite plan is to modify into game room so please look for this end of year at this property >New chairs for the dining area and new cushions for outside have been ordered. >The property should have been fully stocked on garbage bags, paper towels, TP, kleenex, etc and please know we stock excess supplies on all disposables in our office which is only a phone call away to order extras >All our properties are abated during June. La Casita was just completed yesterday June 18th >Agreed on the open food products and sorry our housecleaning missed that >Swing set scheduled for removal next month. Thank you again for sharing your stay with us and hope your able to try one of our Lake Arrowhead or Greater Palm Desert properties soon. My whole family loved this house. Will definitely return. Nice quiet location. We had 8 adults and 2 children and had plenty of room. The kitchen was extremely well equipped. Everything was exactly like the description and that the pictures showed. Perfect! We loved the house. Beautiful, spacious. Loved the soft, warm bed linens. Fantastic kitchen; I'm the cook so I really appreciated that the kitchen was large and open to the large dining and living room. Very well equipped. Lovely fenced yard. The only detractors were that some folks in my family were a little cold (the thermostat is locked) and the spa had way too much chlorine.